Bundles are an incredible way to save money on resources you need the most. 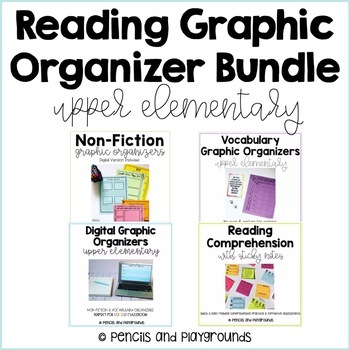 This bundle is filled with various graphic organizers to use with ANY book or vocabulary unit. These graphic organizers touch on most essential skills and are ideal for upper elementary students, but can work for various grade levels. . I often use these reading graphic organizers during small group/guided reading, as a quick formative assessment, and as graphic organizers during whole group instruction. Students will be responding to what they read, checking for comprehension, and thinking critically. ♡♡Please do not hesitate to contact me if you have any questions or concerns. You will be able to receive free products & stay up-to-date on my new products and sales! I’d love to connect with you! You can find me on Instagram, Pinterest, and Blog. You can get TPT credit to lower the cost of your future purchases by going to your "My Purchases" page. Beside each purchase you'll see a Provide Feedback button. Simply click it and you will be taken to a page where you can give a quick rating and leave a brief comment for the product. Each time you give feedback, TPT gives you credits that you may use to lower the cost of products you would like to buy in the future.